After reading the scoring sheet and the accompanying background paper, and speaking with the Deputy Assistant Secretary of the AF (Installations), I’ve come away with new reservations—this time about the process. Check out the new Stop the F35 Facebook page recently put up by die hard Stop the F35 volunteers. Connect on Facebook, like us, help spread the word. We have had some recent victories, but we still have work to do. Thanks for your support. I am writing to you to express my concerns about basing F-35’s in the Burlington area. First of all I’d like to call your attention to the front page article in the June 27, 2012 Burlington Free Press, “Grave Mistakes Made in Choosing Burlington” http://www.burlingtonfreepress.com/article/20120626/NEWS02/306270004/Councilor-Grave-mistakes-ranking-Burlington-F-35? How loud is a landing F-35? Thanks to Save Our Valley from Boise, Idaho. The Vermont Guard Commander, General Dubie, held a brief press conference last week to defend the basing the F-35 bombers. “Vermont Guard commander defends basing of F-35s” While attempting to downplay noise impacts, and to seemingly cast doubt on the validity of the Air Force’s own draft Environmental Impact Statement, the General offered no actual data to back up his claims and assurances. Reasons to say no to the F-35…. 1. According to the Air Force Draft Environmental Impact Statement (EIS) the F-35 bomber is much louder than the F-16. The EIS also shows that basing the F-35 here will place 1366 additional houses in Burlington, South Burlington, Winooski, Williston and Colchester within the FAA-defined “incompatible with residential use” 65 dB noise level contour. 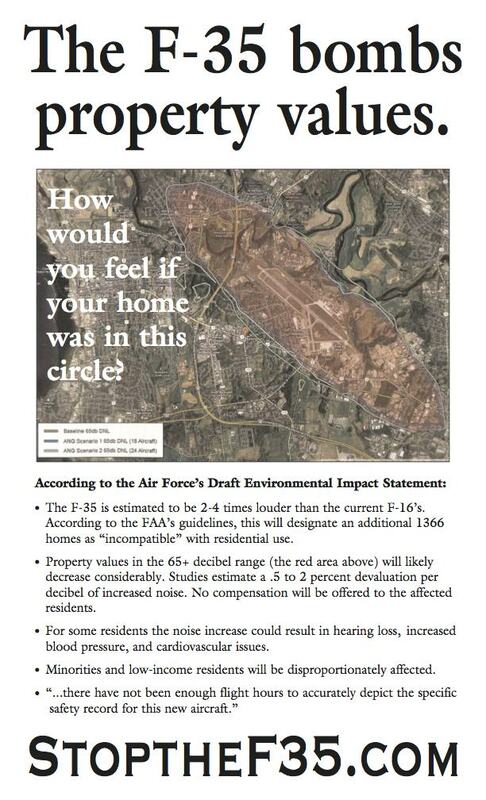 Over 100 homes within that contour have already been demolished in S. Burlington because of F-16 noise. The F-35 will bring half the houses in Winooski and a dozen streets in Burlington within that “incompatible” contour. Please contact the people listed below before June 20th and tell them you don’t want the F-35s coming to Vermont. Postal mail needs to be postmarked by June 20th.